Ever wonder what it would be like to live in one of those aviation communities where taxiways and runways took precedence over roads and all your neighbors thought about aviation as much as you did? Once a year I get to experience one of the largest aviation communities in the country, Chicago, IL. The arrival of the Chicago Air & Water Show magically transforms my city into a land where everyone has airplanes on the top of their mind (whether they like it or not). Whether at the water cooler at work or mingling with neighbors people are suddenly speaking my language: aviation. It is for this reason that the Chicago Air & Water Show has become one of my favorite weeks of the year. Like most pilots, I can't hide my love for aviation so friends, family, coworkers and neighbors know of my passion for aviation. 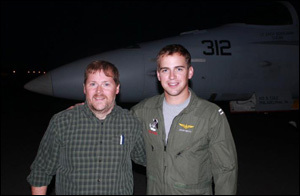 When a friend of mine learned his brother, a pilot in the U.S. Navy, would be bringing his plane to town he thought to reach out to me to see if I would be interested in coming out to airport to greet him. Of course I was interested, however, the thought of sitting in rush hour traffic on a Friday night driving from the northside of Chicago, through the city to Gary and back was not too appealing. 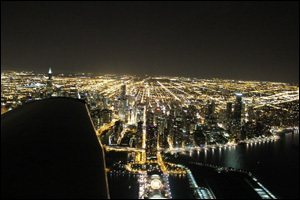 So I decided to make a flight experience out of it and instead take a beautiful flight along the Chicago lakefront to Gary. Al Waterloo, fellow club member and host of Simple Flight Radio (Check it out) joined me for the adventure. Pilots love sharing their love of aviation with others and showing off their latest plane. The crowd a pilot draws to see their plane often varies based on the cool factor of the plane they are currently flying. As a result, John Keith, a member of the Virginia Beach based Raging Bulls (VFA-37), a squadron of F/A-18C Hornets, was greeted by a large family contingent when he arrived in Gary on Friday night and I was happy to be invited to be a part of the welcoming committee. John took the time to point out some of the unique features of his plane and to talk about some of his experiences landing the F-18 on the USS Harry Truman Aircraft Carrier. After learning about his airplane the entire family, John, Al and I walked the tarmac at Gary International Airport which resembled a military base that night. Alongside his Hornet were a few of the larger F/A-18 Super Hornet, T-38 Talons, A-10 Warthogs a F-4 Phantom in addition to civilian planes like T-6 Texans and T-34 Mentors. As a pilot I loved looking at all these planes but also enjoyed the fact that everyone else seemed in awe of these machines as well. It was great getting the VIP tour of the tarmac as I know on the Saturday and Sunday of the show people lineup along a fence-line to see these airplanes in action from a distance. As we were walking back to the FBO, John picked up his flight bag which was filled with all his maps and old school paperwork used to navigate a plane that was built before the age of glass panels. He pointed out that the Archer I was flying had more advanced navigational functionality than his F-18. True enough but I would trade rides in a heartbeat. After thanking the Keith family for letting me be a part of their family for the night we climbed back in the Archer III for our return flight to Palwaukee. On the flight back the city was aglow, the moon was hidden below the horizon, making the effect of the city lights that much more impressive and a perfect end to a night of celebrating aviation. It saddens me when the annual airshow ends and the light switch is flipped and my fantasy land of aviation enthusiasts evaporates. Though, I love that for a week aviation was brought to the forefront and surely some of those in the crowds at the Chicago Air and Water Show now have a new passion for aviation like this girl jumping up and down as the Blue Angels Fat Albert C-130 flew over during the show. That is so interesting! I would like to go on the airshow once. Where could I take a ticket there?